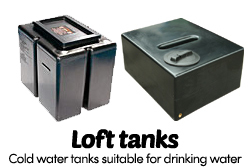 Here we have a selection of loft water tanks ideal for all lofts. Many of our loft tanks come with all the fittings inside the tank including ball-valve and fittings. Inside the Polytank loft tanks is also the insulation jacket for that tank. There are no pre-drilled outlet in these tank so you will need to cut the inlet and overflow where you require it.